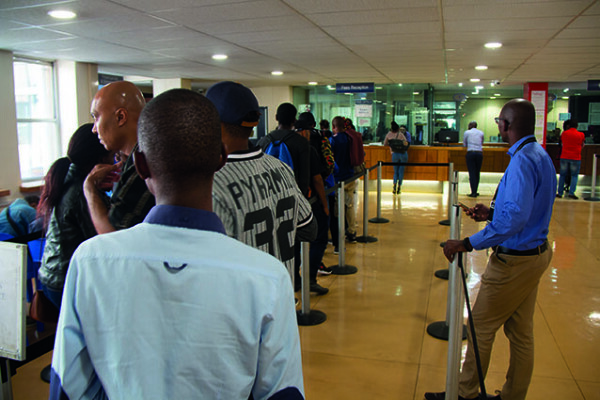 THE Wits University’s new fee waiver policy has been set up to help students with debt to register, however, some students are finding even this concession does not go far enough. According to the policy, “all students who owe R10 000 or less will have their debt automatically rolled into their 2017 fees and will be allowed to register. Students who have debt higher than R10 000 will be requested to pay half the outstanding balance and enter into a payment plan for the remainder of the funds, before being allowed to register”. Lauren Theys, a third year architectural studies student, says the provision is not so helpful to her. She owed the university R 30 000 and had difficulty raising the R15 000 she needed to pay in order to be allowed to register. Her circumstances are typical for the so-called “missing middle”. Her mother, Hazel Theys, 61, is a retired teacher who supports Lauren and her brother who’s studying at university in the Northern Cape. “Her [Lauren] father passed away two years ago, I am the one responsible for her fees now and I’m retired. I have her at varsity and my other son in varsity in Kimberly at Sol Plaatje, plus I’m paying off my bond, which takes half of my pension. So it’s very difficult to keep both children at university at this stage. “I had to get a loan and luckily it was approved,” said Hazel. The other issue the Theys family raises is what they say is the lack of assistance from the university after Lauren fell ill last July. She was advised by her doctor to stay at home for the rest of the second semester. Despite this, the university still held her liable for the entire second semester fees. “When I was still sick I contacted and emailed the relevant people, telling them this is my situation in terms of fees,” she said. Lauren has three courses outstanding on her degree and she will apply for a fee waiver after paying the 50% required although she doesn’t know how she will pay back the remainder of last year’s fees and this year’s tuition. Wits Vuvuzela contacted the university to ask whether there are other options available to students who, like Lauren, owe more that R 10 000 but cannot afford to pay the 50% to qualify for a ‘fee waiver’, but there was no response to our emails. We also asked what steps the university will take in the case of a student who fails to pay off the debt after signing the fee waiver agreement, but the fees office had not responded to this question either by the time of going to press.